Australian comedian presenting works for children & adults around the world. Kids, it’s time to pull on your best rock ‘n’ roll outfit and get ready to release your inner rock legend with air guitar, dancing and hit song lyrics! 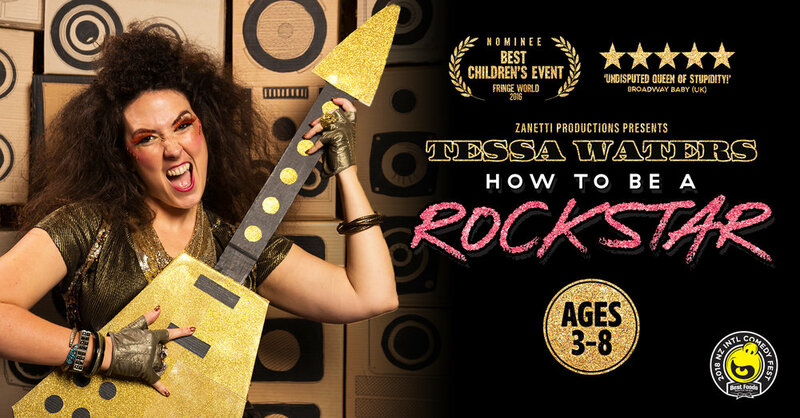 This high-octane hour of hilarious high-energy fun from multi-award-winning comedian Tessa Waters will have all youngsters feeling like true rock stars and at the same time will promote body positivity. Spandex, sequins and killer dance moves collide in a physical comedy show that is part disco, part mock training session and all outrageously fun. High octane sketches and improv stupidity smash together as multi- award-winning comedian Tessa Waters (Over Promises, WOMANz) takes her audience on a joy-ride through her Fully Sik sense of humour. Somewhere between Broad City and the Boosh, Fully Sik is Tessa at her non-stop rollercoaster of LOLs best combining physical theatre, sketch and dance. It’s loud, ludicrous and dumb - while tackling the capital-I Issues. Get ready for a pillow-fight of elated highs. Multi award-winning Aussie comedian Tessa Waters returns with an hour of stonkingly outrageous sillyness. Dance, clown and sketch collide in this ridiculous genre busting show that has upped wet pant stats drastically worldwide. A Gaulier-trained dynamo and professional idiot, Tessa’s show WOMANz broke records at Melbourne Fringe and she has toured Australasia and the UK ever since. Think Trygve Wakenshaw at a feminist disco. Tessa Waters is a multi award winning comedian, actor and writer and mentor with over a decade of experience in creating acclaimed comedy, theatre and short films which have played to sell-out crowds around Australia and the UK. In 2017 she launched her own mentorship program with the most recent achievement being The Travelling Sisters winning Best Comedy at Melbourne Fringe Awards 2017. In 2018 she is mentoring 20 emerging artists from around Australia and the UK. She is a committee member on the Moosehead Award and was on the selection committee for the 2018 award round. Her previous work includes; WOMANz, which broke records at the 2014 Melbourne Fringe being the first show ever to WIN three awards in one night, OVER PROMISES, which was NOMINATED for Best International Show at the New Zealand International Comedy Festival 2017 and most recently FULLY SIK which WON the Best Comedy Weekly Award at Adelaide Fringe 2017 and has just been filmed as a full hour special for ABC’s Comedy Next Gen series 2, (due to air Feb10th). In 2015 she was touted in the TOP 5 Hottest New Things in Comedy by the Sydney Morning Herald for her MICF season. She is also one third of Fringe Wives Club who WON Best Cabaret at Adelaide Fringe in 2018 on top of being NOMINATED for Best Newcomer at the MICF 2017 and Best Cabaret at FringeWorld 2017 and Melbourne Fringe 2017 as well as being the recipients of the 2017 Moosehead development award and has just been picked by the Herald Sun for the 2018 Hottest 100 in entertainment, one of seven comedians chosen alongside Lano and Woodley. In 2018 Fringe Wives Club have launched a production company The Furies of which Tessa is lead producer and will be working across a suite of projects in 2018 presenting and developing work with strong Female, Queer and Culturally Diverse voices.